In case you wonder why we don’t understand God, He tells us the reason. He says as far as the heaven is from the earth is similar to how far above us are His ways and His thoughts. God is beyond us, above us, raised up from us. For why my thoughts be not your thoughts, and my ways be not your ways, saith the Lord. For as (the) heavens be raised (up) from (the) earth, so my ways be raised (up) from your ways, and my thoughts from your thoughts. Makes understanding the reason behind Christ’s entrance into the world a bit easier, however. If God is so far removed from us, then His coming as an infant – actually on the earth – makes perfect sense. How else are we to grasp who He really is? So much better is Jesus than Moses. So much better is the new covenant than the old – hearts not of stone, but of flesh and blood where God’s love is written directly by His Holy Spirit. That Jesus comes to earth is because God is raised up from us. Jesus descended to us so that we might live again. Jesus dies on the cross, accomplishing payment for the sins of the world. He is buried, visiting hell to remind our adversary he has no power over us. He is risen! to achieve glory for Himself and for His children, the sons of God. Jesus takes the cup, blesses it, gives it to His disciples, tells them to drink of His blood in remembrance of Him. He takes the bread, blesses it, breaks it, shares it with His disciples, tells them to eat of His body in remembrance of Him. The last supper with His followers is here. What makes us live for Him? His love, and the power of His resurrection from the dead. As we die with Him in weakness, so we rise with Him in power. He dies for us. We live for Him. Jesus is defiled, defouled, punished, wounded, scourged. God the Father treats Jesus as sin. As a result, we — who err and wander astray, each to our own way — are made whole, healed, restored to God’s graces. 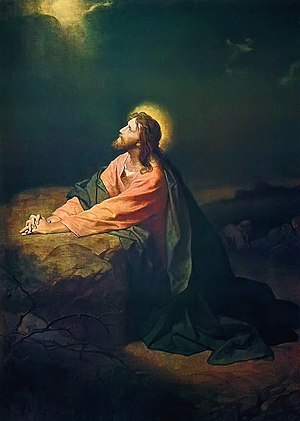 Jesus knows beforehand He is to suffer in Jerusalem, and He privately warns His twelve disciples. He takes them aside, and says emphatically, “Listen! We are going up to Jerusalem.” Jesus is telling them to be prepared, to get ready for an event that alters His human life, their lives, and the lives of the rest of the world. 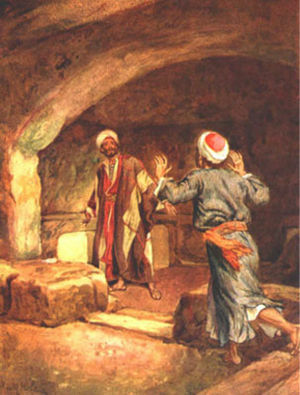 After His crucifixion, His disciples are hiding, terrified having forgotten Jesus’ word, “Listen!” They are not ready, but the women — Mary Magdalene, Mary, the mother of James and others with them — are prepared before the Sabbath to bring spices and perfume to the body of their Lord, Jesus who is kindly taken from the Cross and entombed by Joseph, one of the Sanhedrin. They are not ready for His resurrection, but are dealing with an immediate need of His body. All are devastated, doubting, and then amazed at the events Jesus predicts for them before they go up to Jerusalem. Not one is fully prepared.